It's Friday the 16th at Nido de Condors, Camp II. It's really, really good weather. It’s a serious mountain and always a bit cold here. 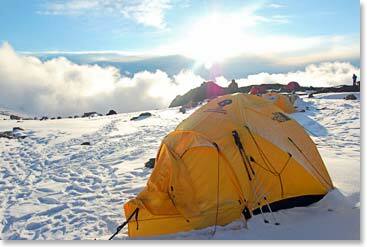 A little bit of wind sounds like a lot in the rustling nylon of our mountain tents. But actually conditions are quite good right now. 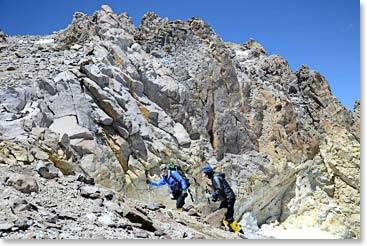 I got to give big kudos to our Bolivian climbing porter team on how hard they are working. Now Fareen, Alex and Sergio came up from Plaza de Mulas this morning with loads. This is the same team that had gone down two days ago with Rob and Elaine. Sergio put Rob and Elaine on the helicopter yesterday morning. They are now back again. They go up and down every day. They take our waster down and carry up new supplies. This morning after having carried from Plaza de Mulas they packed up loads of crampons, ice axes some of the heavier climbing gear for some of the members and they are getting ready to climb on to High Camp, camp Berlin. Now what the climbing team Leah, Doug, Chuck and Gord and I are going to do, along with Osvaldo, is we are going to climb up a bit higher here, to Nikki’s rock, take a look at the higher route as it goes up toward High Camp Berlin, see how we breathe how we feel. It’s nice weather I think we are going to do well. We are short of breath when we do a little bit of movement here but everyone’s appetites are high. This morning for breakfast Maria fixed pancakes with strawberries and maple syrup and scrambled eggs and everybody ate very well. We are having a little lunch now before we start up. We are having hot soup and sandwiches. Now with the high mid-day sun above us we are going to get our packs on, wear our double boots to see how they feel and climb up hill for a couple of hours. 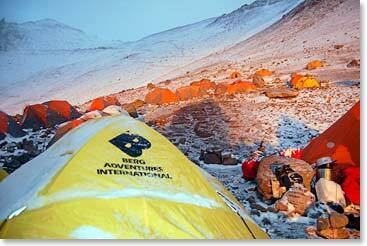 Chuck, Gord, Leah, Osvaldo and I are stepping back into Nido de Condors camp after our trip up to Nikki’s rock. We were about 19,000 feet and it felt good up there. We lay on the warm ground, with the sun heating the ground. If you were upright at all you felt the mild wind, quite cold temperatures. I’m sure it’s a bit below freezing, a bit below zero, even in the middle of the day even on a sunny day. The team felt good. Leah eventually said let’s go down and see if Maria has popcorn, which of course she will. Maria has popcorn ready every day for tea time and I know Leah will probably be having a few Oreos as well. So that replenishment will do us some good. But the hike today into higher elevations also did us good just to know we are on track and adapting to go higher. As you know tomorrow our plan is for us to go to Berlin Camp, that is High Camp and get ready for the summit attempt which will be on Sunday. I am encouraged about how the team is doing. I am watching the weather and it looks good now. 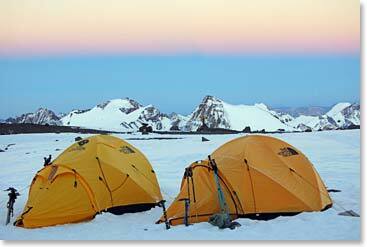 We will see how it holds up over the weekend as we get ready to climb to the summit of Aconcagua.